 Solar power is one of the solutions to overcome the energy deficit in the world. The generation of solar power do not has any adverse effect on the environment.  Ministry of new and renewable energy [MNRE] Government of India is developing solar/green cities all over India under the green initiatives. 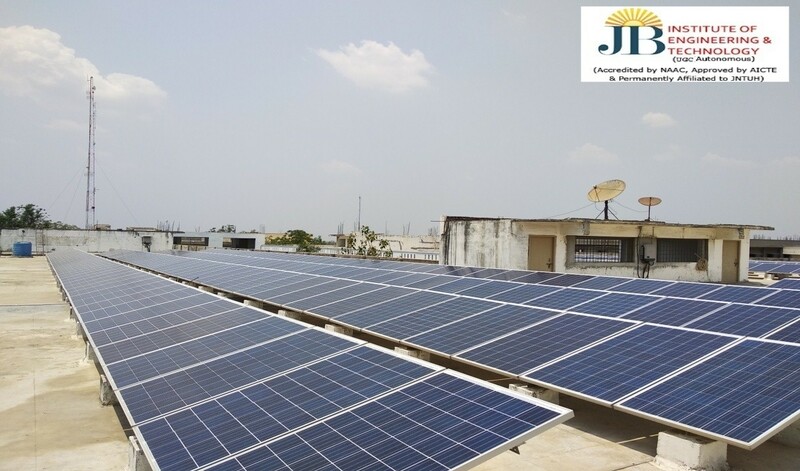  JBIET has taken initiative in promoting green energy concepts in its campus.  In its pursuit to become energy efficient, J.B institute of engineering and technology, Bhaskanagar, Moinabad, Hyderabad, Telangana formally commissioned a 100 kWp solar PV plant on 26th February 2016. This project is one of the best among all the JNTUH affiliated colleges in Telangana.  The plant consists of a total 402 PV modules of each of 250Wp supplied by Sri Savitr Solar Pvt. Ltd. Hyderabad installed at rooftop of main block in JBIET.  The entire project is executed by Fourth Partner Energy Pvt.Ltd. Hyderabad.  This plant will generate more than 1.5 lakh units every year. Average monthly power generated is approximately 12600 units. The plant provides substantial cost savings on the power consumption for the college.